Replacement connection terminal for kryographics series graphics card blocks and kryoM.2 water blocks with high resolution OLED graphic display with USB interface for data visualization. The VISION controller is equipped with a 128x64 pixels OLED graphic display. The OLED technology guarantees exceptional contrast ratio and wide viewing angle of the display. Up to twelve display pages can be configured to show a variety of PC hardware data. Design layouts include single value screens, lists, bar graphs and charts. All texts and graphical logos may be modified to accommodate personal preferences. A note pad function can be used to display short memos. 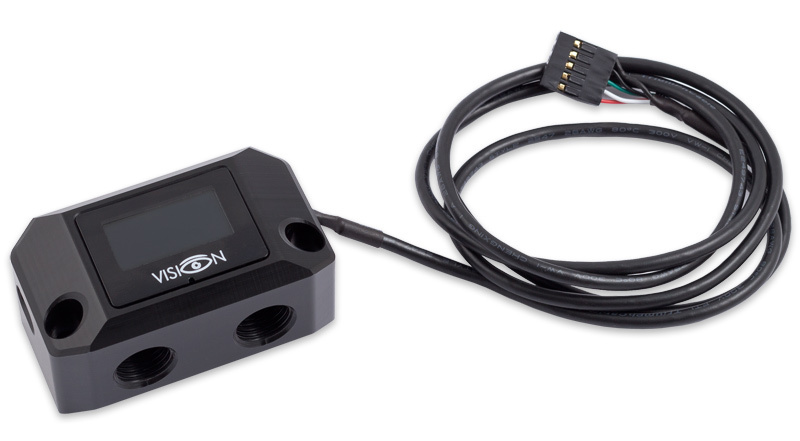 The VISION controller features a temperature sensor connector. If a compatible sensor is connected, temperature is constantly monitored and can be used for display pages. An alarm function can trigger a configurable action if an adjustable threshold is exceeded. The VISION controller features one connector that can either be used to connect an Aqua Computer flow sensor or as an alarm output for emergency shutdown of the PC. For both options, additional accessories not included in delivery are required. The aquabus interface can be used to connect the VISION controller to an aquaero 5 or 6. Both devices can then exchange various sensor data via aquabus connection. 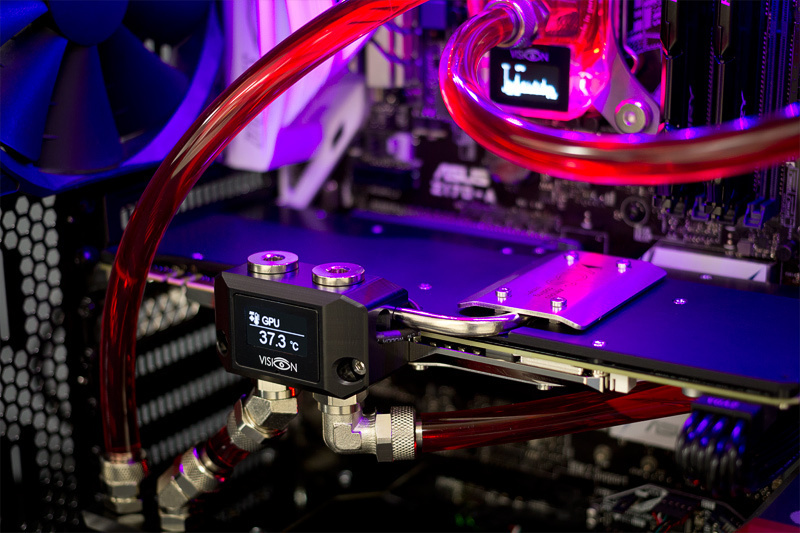 Please note: Water block and back plate not included in delivery. This terminal must not be used without active back plate! This product was added to our catalogue on Monday, 21. November 2016.